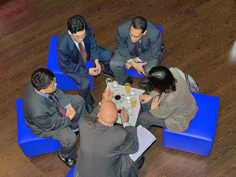 As a global company, in order to attract and keep the best employees, Knorr-Bremse motivates its staff with challenging, appealing tasks, targeted personnel development with international development opportunities, employee involvement, occupational health management and a number of other services and offerings. Knorr-Bremse is growing ever more strongly by working together across departments and locations as part of our daily agenda. Take your own look at the opportunities that Knorr-Bremse offers its employees around the globe. A deciding factor in our success is the motivation and willingness to perform of our staff. But just how satisfied are our employees with their jobs and work environment? We want to know. For this reason, we regularly survey our staff to determine the satisfaction level and expectations of our employees. We use the knowledge gained as a basis for continuously implementing optimization campaigns. Preventive health care plays an important role at Knorr-Bremse. Our Sports and Health Program offers all employees the chance to promote and improve their fitness and health. In addition, our locations offer a wide variety of services for our staff, from additional contributions to retirement funds to allowances for public transport.